In early May 2008, an extreme Category 4 cyclone struck the southern Myanmar coastline for the first time in recorded history, devastating the Ayeyarwaddy Delta. Cyclone Nargis brought behind it a tidal surge exceeding 4 meters above the norm, inundating vast areas. The worst cyclone to hit Asia since 1991, Nargis killed 140,000 people and destroyed 700,000 homes. 2.4 million survivors, one third of the region’s and 5% of Myanmar’s population, suffered severe losses. Mortality was highest in the south and coastal villages of the Ayeyarwaddy Delta, where the impact of the Cyclone was compounded by the accompanying “tsunami”. Close to where Nargis made landfall, the islands of Haing-gyi and Alekyun (“Middle”), Island in the western Ayeyarwaddy Delta, suffered major loss of life and catastrophic damage. A price tag of over US$4 billion has been placed on damage and losses from the Cyclone, a level of devastation on par with that caused in Indonesia by the 2004 Asian tsunami and equivalent to 21% of Myanmar’s 2007 GDP. In the immediate aftermath of Nargis, Myanmar Business Coalition on AIDS (MBCA), http://mbconaids.org/, an independent, recognized Myanmar NGO and enjoys tax-exempt status granted by Myanmar’s Government, became involved in post-Nargis relief as a member of Cape Negrais Relief and Recovery Committee (CNRR), http://www.capenegraisrelief.org arranging clearance of international aid flights, transporting, storing and distributing food, water, medicines, clothing, shelter and other materials to survivors, organising and leading medical relief teams and under-taking temporary repairs to schools, clinics and hospitals. In summer 2008, once international relief assistance was established in the Delta, MBCA and CNRR embarked upon a comprehensive recovery programme to build “Environmentally Sustainable Villages” (ESV). The programme has been generously supported by donations from various foundations, charities and individuals in Hong Kong, Singapore, Brunei and elsewhere in Asia, as well as Myanmar. Fu Tak Iam Foundation Limited was among the early supporters to commit to assisting the recovery programme after Cyclone Nargis through its donation to Asia Environmental Foundation Limited’s Myanmar Cyclone Fund which put it towards the re-building of Kwin Gyi village in MBCA’s ESV programme. The ESV programme employs dedicated and professional managers and technicians. It helps Nargis survivors return to their normal lives through construction of new homes, schools, clinics, village offices, roads, bridges, jetties, drainage, installing ‘solar-power’ed lighting (a first utility for these Delta villages), repairing water supplies and building storm shelters/ community buildings as well as environmental clean up and village greening. MBCA’s objective is to build homes providing an improvement in Delta living conditions, yet remaining affordable. They are designed to be stronger and longer-lasting than the houses destroyed by Cyclone Nargis, “building back better than before” and to adopt environmentally sustainable concepts as core principles. The size and selection of building materials is determined according to the request and regulations set by the Myanmar Government. The pilot ESV of Auk-Pyun-Wa on the eastern side of the island of Alekyun, (Middle Island), in the West Ayeyarwaddy Delta was completed in December 2008. All Auk Pyun Wa’s old houses were totally destroyed during Cyclone Nargis and the subsequent tsunami, together with all community services, the school and monastery. The ESV consists of 126 homes, a primary school, a clinic, jetty, roads and bridges. 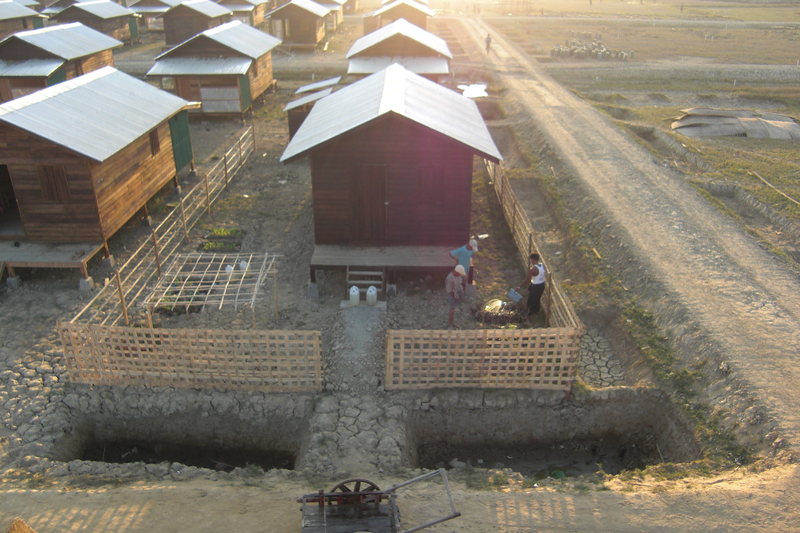 Alekyun’s 350-person storm shelter and community building, to safeguard lives in the event of another big storm, is similar to those that have saved many lives in Bangladesh. It was among the first storm shelters completed in the Delta post-Nargis. The village of Kwin Gyi also in eastern Alekyun is the second ESV. Kwin Gyi was devastated both by wind and the “tsunami” flooding that accompanied Cyclone Nargis. Mortality was high as a result. The original bridge over the creek separating Kwin Gyi and the adjacent town of Thingangone, was a wooden structure merely nine feet wide. When the Cyclone hit, the force of water flowing under Kwin Gyi’s bridge surged, swiftly destroying the bridge. Kwin Gyi’s villagers together with many more from other villages to its south were stranded on the Kwin Gyi side of the broken bridge. Several hundred people died here on the night of May 2-3 2008. Kwin Gyi’s new village has been built further back from the waterfront, on land donated by the Government with a total of 133 new homes. The houses consist of 12 feet x 28 feet twin-room design, with a kitchen at the back and an open verandah in front. The houses are constructed using an environmentally friendly local wood frame that resists the saline deltaic environment, a wooden plank floor, wooden walls, concrete footings and aluzinc roof house type. Like most other villages in the Ayeyarwaddy Delta, there was no electricity at Kwin Gyi prior to Cyclone Nargis. As a major improvement to living standards, each household has been provided with two battery-charged LED lights using an independent solar module powered lighting system. In another improvement to living standards and the environment, which it is hoped will also have positive implications for the health of villagers, and an independent latrine is provided for each household. The kitchen area is walled with CGI sheet to prevent fire, a major cause of mortality and property loss in the Delta. The houses are coated with earth oil to protect the houses from the harsh deltaic climate. Bamboo mesh fencing separates each household plot from its neighbors and family vegetable gardens have already been planted. 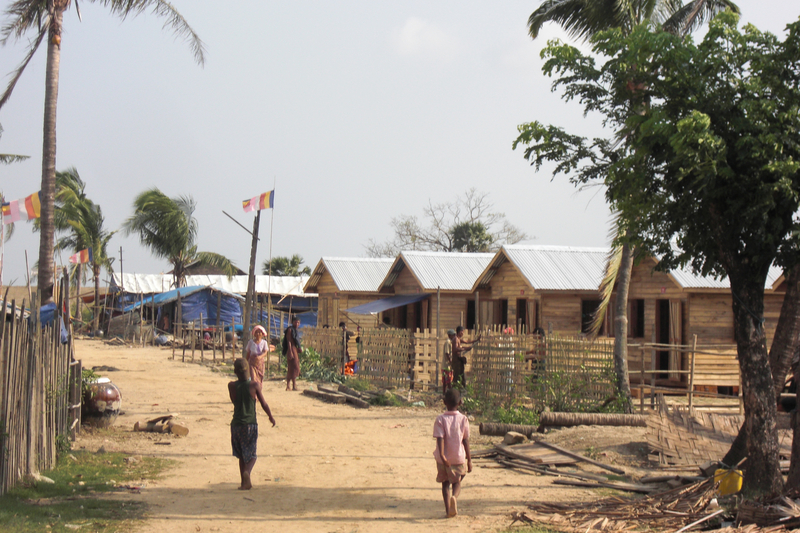 Lots were drawn among the villagers to allocate the houses and 117 families happily moved into their new homes ahead of the onslaught of 2009’s rainy season. 99% of all other works at Kwin Gyi were completed by end June 2009. 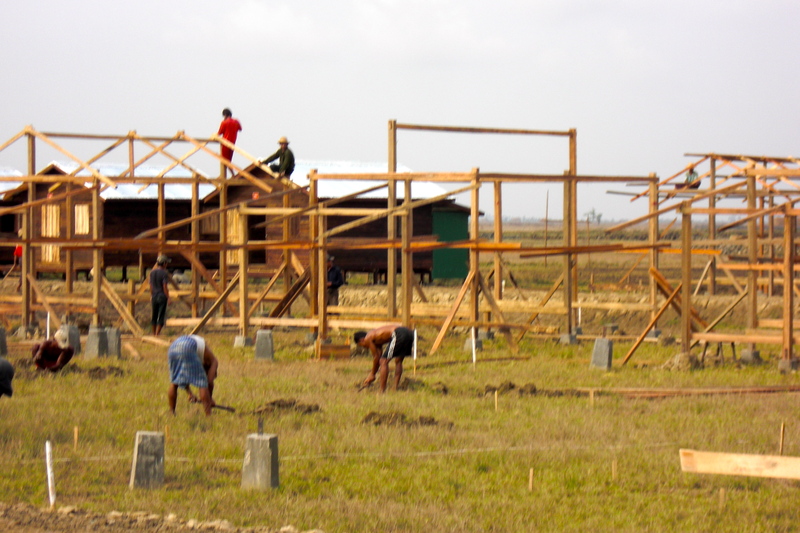 The balance will be 100% complete by July 2009, including construction of the last 16 additional homes for families that more recently returned to Kwin Gyi. A critical core element in the ESV program is re-establishing livelihoods to enable Nargis survivors to independently provide for themselves and their families longer term. The majority of villagers in Auk Pyun Wa and Kwin Gyi are fishermen. Others are farmers and small tradesmen. All lost virtually all their tools and equipment during Nargis. The ESV livelihood recovery programme includes donation of fishing boats, nets, buffaloes, other equipment and financial support.